SikhNet Youth Film Festival Volunteers? 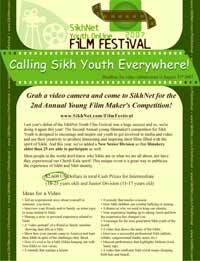 Here at SikhNet we could really use your help in spreading the word about the SikhNet Youth Online Film Festival. There are lots of people that view SikhNet who are on the internet, but many more who are not online and might not know about this event. This is where your help comes in! I’m trying to find some volunteers that can help spread the word about the event in their local community. We all talk about helping the Sikh youth; well this is a concrete way that you can do so. All it takes is some of your time and energy to help make this event successful. I’m looking for committed individuals who can help in any of the following ways. If you would like to be a part of the SikhNet organizing group for this event and help with any of these items, please email me and let me know how you are able to help. We have created a few different ways to help spread the word. There are two options for flyers. You can print them out and then give to friends, hand out at any local event or youth camp, post in your Gurdwara, run in your local newsletter or newspaper, radio, TV, etc. I’m sure you can think of other ways to get this information out too! View and Download the Flyers. Email anyone who you think might be interested in this event. Send a message to your friends on any of the social network sites that you are a part of. Rally up your friends to get involved and make a video (and have a chance at winning cash prizes!). It’s summer time and there are always lots of different youth camps which happen at this time of year. One idea is for camp organizers to create a part of the camp where the youth have a project of making a video for the youth film festival. I’m looking for individuals who know of camps and could talk to the organizers about doing such a project. What better way to engage the youth and have a creative means for them to communicate and learn something!? Many youth might feel uncomfortable doing a video on their own, but with a few other youth they could all work on it together and learn a lot. This was what one school in India did last year and it was very inspiring seeing the young kids make this video. If any camps or groups would like to do a project like this I would be happy to help advise and give more ideas. Do you know of anyone who might be interested in supporting this event? We need help with getting people and companies to become sponsors of the youth film festival. This is a unique opportunity to support SikhNet and the Sikh youth who are entering the competition. Plus, you or your company will be recognized all over the world by tens of thousands, so it is great exposure. You can read more about the different sponsorship options. There are always lots of events happening all over the world where Sikhs gather. It would be great if you could make an announcement or encourage youth in local communities to make a video for the film festival. We are planning to make a video about the film festival which could be shown at Gurdwaras or other events. When that is completed we will post it online. In return for your support, those of you who run camps, have organizations, or similar type of organization we can potentially list you as a Youth Film Festival Partner on the website. This would be beneficial for those that want some exposure for their own activities. I can distribute flyers at Los Angeles/Fresno area Gurudwara’s. Also have them announce them at the gurudwara. I have already upload the Sikhnet Youth Link on my blog. And i will spread around the news around the Malaysian Sikhs. and can announce in the nex gurudwara. The link has been added on my blog and emailing friends. I will distribute flyers in aurangabad area. The image has been added to my store. I look forward to what the contestants bring to us this year.Â The films get better every year.